Snow and ice are both precipitation -- processes that remove water from clouds. Clouds, regions of the atmosphere with high relative humidity, are made of droplets of water and/or bits of ice. Even though water is much denser than air, these droplets and ice crystals are small enough to be suspended by random upward air motion. When these droplets or crystals join together, gravity overcomes the suspending force and we have precipitation. Rain is liquid water (in middle and cold latitudes, almost all rain originates as ice in clouds). Sleet is rain that freezes after exiting a cloud. Freezing rain is liquid water that freezes after contacting Earth. Freezing rain causes dreaded ice storms and is a major hazard to transportation and utility lines. Snow is water that freezes and aggregates in clouds. Snow, as we'll see, takes countless crystalline structures. 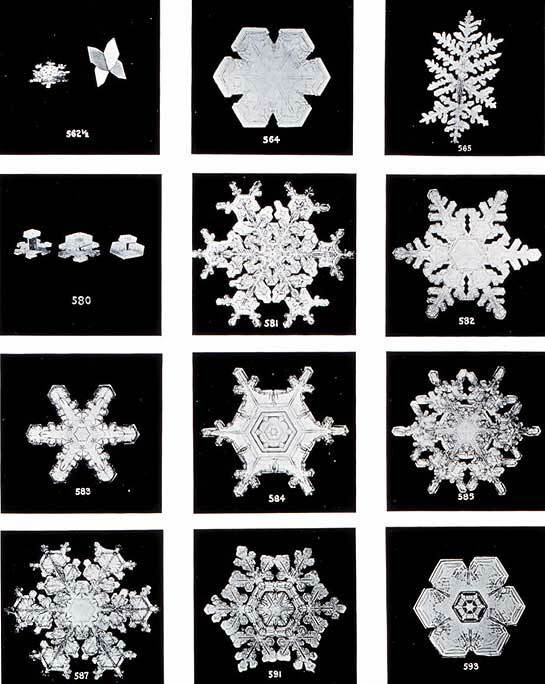 *The snowflake images on this page (unless otherwise noted) were made from photos taken by Wilson "Snowflake" Bentley, a Vermont farmer-scientist who initiated the study of snowflakes by shooting fresh flakes. Scientists now capture snow flakes on a liquid polymer that creeps into a 3-D mold around the flake. Water freezes when it drops below the freezing point and loses an amount of energy called the heat of crystallization. When a large amount of water freezes, we get hunks of ice. Things grow more interesting when water vapor freezes in the atmosphere. Small water droplets are highly reluctant to form into larger droplets (maybe they feel perfect just as they are...). Even when the temperature is below freezing, the laws of thermodynamics, which govern the movement of energy in matter, govern the crystallization process. In air, pure water will not freeze until far below 0 degrees C. Crystallization occurs much more easily around a particle of dust, or even a bacterium. Similarly, water vapor joins together much more easily around a tiny nucleus. Cloud seeders try to cause rain by inserting these nuclei into clouds, but their effectiveness is debatable. At any rate, once the congregation process starts, it cascades. Just as water coalesces much faster on existing droplets, ice crystals in clouds readily gather onto existing ice crystals. Accretion is the crystallization of water droplets on an existing ice crystal. Deposition occurs when water in the gas phase deposits onto an ice crystal. Aggregation is the union of existing ice crystals. The rate depends on crystal shape: dendritic -- fingered -- crystals are most likely to aggregate. From our description of the four precipitation categories, you may notice that the formation of snow crystals is just the start — the crystals may be changed or destroyed before they blanket a ski slope — or your driveway. Snowflakes may join together after leaving a cloud. Because dendritic (finger-shaped) crystals are most gregarious, dendritic flakes are the largest. If the air beneath the cloud is warm, the falling snowflakes may melt, forming raindrops. If the air beneath the cloud is dry, the flakes may sublimate -- change directly to water vapor without passing through the liquid phase. Sublimation causes "fallstreaks," downward-pointing tails of snow that never reach the ground, beneath high, cirrus clouds. Crystals are molecular structures with a specific bond geometry. Because water molecules only bond at 120 degrees, ice crystals and snow flakes are all based on hexagons, which have 120-degree intersections. Temperature affects crystal shape (see table on this page). Large, dendritic flakes grow best at temperatures of -10 to -12 degrees C, while plates grow at warmer and colder conditions. 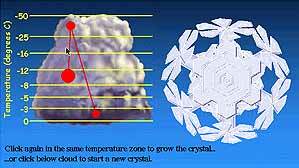 Note that the temperature of formation determines the original crystal shape. If the flake passes through dry air, it may sublimate. If other ice crystals are present, they may aggregate onto the crystal. If liquid water is present, it may accrete. All these processes can alter a flake, as you can see in our nifty Java applet. Grow your own snowflake here! Humidity -- a.k.a. water vapor pressure in the cloud -- affects the growth rate due to deposition. Logically, an abundance of raw material is needed to create a rapid snowfall. 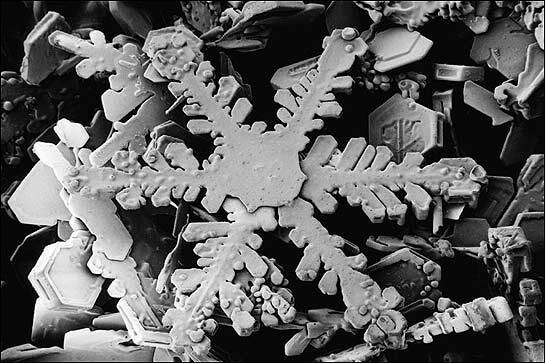 Because temperature and humidity vary from place to place, snowflakes take innumerable crystal shapes. And since both conditions change as a flake bounces around in a cloud, the basic shapes can blend, as seen in the plate-dendritic flake shown here. We're getting to a pressing question: Is there any truth to the myth every one of the countless trillions of snowflakes has a unique shape? We asked Pao-Kuan Wang, an atmospheric physicist who studies flakes and ice in clouds at the University of Wisconsin-Madison, and he told us it depends on how hard you look. "With a microscope, going down to the molecular level, of course they're all different," he says. "But without a microscope, at the superficial level, they may look alike." Pao-Kuan Wang prepares to put a flake under the scope. He suspects that the myth about snowflakes reflects "a kind of appreciation for the complicated design — and because they're so beautiful." Ice in the atmosphere can change the climate. NOTE: This page adapted from our avalanche feature.